MMC Materials Inc engages in manufacturing and supplying of ready mix concrete and other related construction products. The MMC Materials provides aggregates, concrete and pea gravels, limestone, concrete sandblasting, mason sands, building materials, such as mortar mix, sack cement, bagged concrete mix products, and also concrete blocks and bricks. 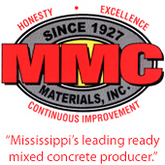 The MMC Materials Inc was founded in the year 1927 and has headquarters located in Ridgeland, Mississippi. The company also has locations in Grenada, Clarksdale, Jackson, Tupelo, Columbus, Greenville, Starkville, Vicksburg, Meridian, Gulfport, and Pascagoula, Hattiesburg, in Mississippi, Memphis, in Tennessee, and Mobile, in Alabama, and also has operations in Louisiana and Arkansas. There are currently 0 consumer reviews about MMC Materials Inc available. Share your review. Please take a note that you are about to post a public review about MMC Materials Inc corporate office on CorporateOffice.com. This review will be public, so please do not post any of your personal information on this website. If you would like to contact the corporate offices of MMC Materials Inc, please use their contact information such as their phone number, website, and address listed above to contact them. However, sometimes staff from MMC Materials Inc headquarters do read the reviews on this website.